We are proud to feature a diverse array of disciplines and approaches in this issue. In “The Nahda in Parliament: Taha Husayn’s Career Building Knowledge Production Institutions, 1922-1952” Hussam R. Ahmed traces the bureaucratic and institutional force of one of the most influential intellectuals of the twentieth century. He reveals new ways to think about the ties between intellectual work, knowledge production, pedagogy, and the Egyptian state. In “‘Jerusalem, We Have a Problem’: Larissa Sansour’s Sci-Fi Trilogy and the Impetus of Dystopic Imagination,” Gil Hochberg offers a reading of both the colonial legacies of the sci-fi genre and the potential for its radical upending. Hochberg ponders the question of Palestine in a futuristic post-factual and post-national time of becoming. In “‘A Fever for an Education’: Pedagogical Thought and Social Transformation in Beirut and Mount Lebanon, 1861-1914,” Susanna Ferguson explores education’s appeal and promise of stability and reform in the nineteenth-century Arab world. In “Infrastructure Crises in Beirut and the Struggle to (Not) Reform the Lebanese State,” Éric Verdeil approaches public infrastructure as a site of political struggle. Verdeil challenges the conventional readings that assert the power of neoliberalism and sectarianism to marginalize state institutions, showing instead how infrastructural policy instruments accentuate Lebanese society’s gaps and inequalities. Finally, in “If We All Leave, Who Will Cut the String: Exiled Intellectuals in Ghada al-Samman’s Thought,” Louis Yako contributes an engaged read of exile, the role of the intellectual, and the possibilities of revolution. This issue also features the usual robust array of book reviews. 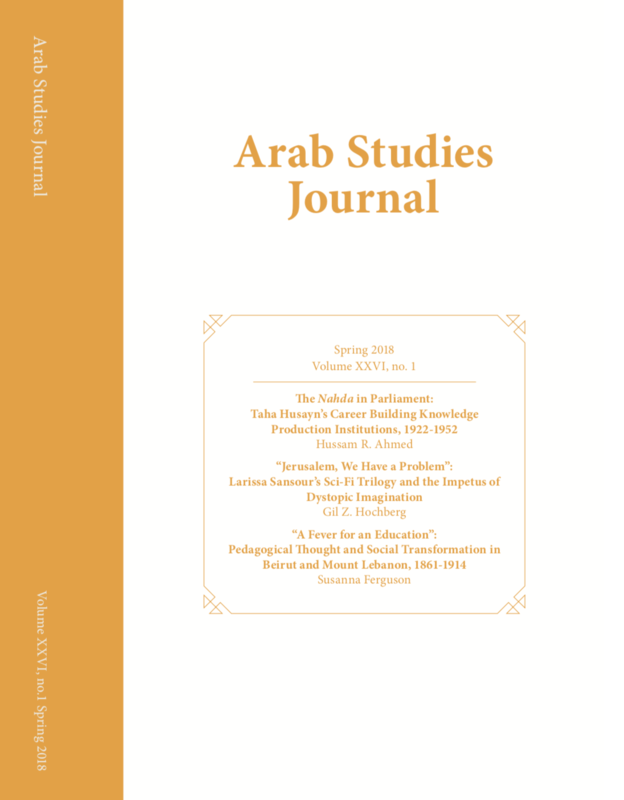 With this issue, we bid farewell to a long-time pillar of Arab Studies Journal and its book review team. Allison Brown, an inimitable editor and thinker, will be departing after a decade of teaching and leading our team with the intellectual depth and editorial precision that have made the journal what it is today. While she may not grace our pages, she will always be part of the ASJ family.